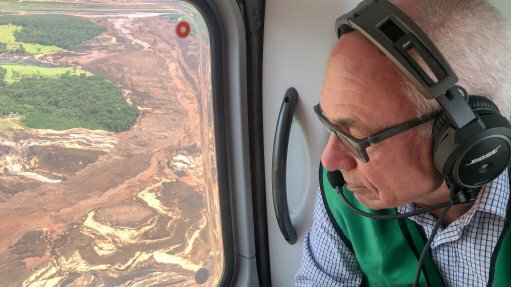 Vale CEO Fabio Schvartsman flies over the Brumadinho dam disaster area. Two Brazilian towns near iron-ore tailings dams in Minas Gerais state were evacuated on Friday as a precautionary measure while inspections of the structures were under way. Vale, which is reeling from a deadly dam wall burst last month, said that the area downstream of the Sul Superior tailings dam of the idled Gongo Soco mine has been evacuated, as part of its emergency action plan for mining dams. This will affect about 500 people in the communities of Socorro, Tubuleiro and Piteiras, in the city of Barão de Cocais. The decision was made as a preventative measure after consulting firm Walm denied the stability report condition of the structure, Vale said in a statement, adding that it had intensified the inspections of the Sul Superior dam. The miner is installing equipment that detects millimetric movements in the structure and is bringing in international consultants to perform a new assessment of the situation on Sunday. The Sul Superior dam is one of the remaining ten inactive upstream tailings dams of Vale and is part of the decommissioning acceleration plan announced on January 29. Meanwhile, about 200 people have been evacuated near a dam of ArcelorMittal, newswire Reuters reports, citing a written statement. According to the news report, the town has been evacuated to allow for more rigorous inspections of the structure. The dam has been inactive since 2012. The National Mining Agency is reportedly planning to ban upstream tailings dams for storing mining waste, after the tailings dam collapse of Vale’s Brumadinho dam on January 25. About 150 people have been confirmed dead in the disaster and another 180 are still missing.